The Rosetta mission was named after the famed Rosetta Stone, which allowed the decipherment of ancient Egyptian hieroglyphs. The term ‘Rosetta Stone’ is now used in other contexts as the name for the essential clue to a new field of knowledge. But context is a problem because the remote past is inaccessible. So we have simply projected our modern experience on to the past and come up with stories to satisfy our craving for order and certainty. Mysteries still abound in Egyptology and comet science but they don’t feature in the stories we are confidently taught. Here on the left is an artist’s impression of a comet surface before the first flyby of the nucleus of a comet on March 14, 1986. It shows icy vapours wafting into space. In the centre is an artist’s impression of the Philae lander on the surface of comet 67 P where you can see the surface still appears icy, the only concession to images of other comet nuclei being the crater and ridges. On the right is the real surface of comet 67 P, which is actually blacker than photocopier toner. But despite the stark reality, the story of comets remains unchanged. The ice ‘must be’ buried beneath that rocky-looking crust. This is a favourite recourse of astrophysicists to have mechanisms buried out of sight inside celestial bodies or black holes where they are difficult or impossible to verify. But this time the Philae lander may have sent sufficient information to expose this convenient fiction. So powerful is the belief in the story of comets as primordial dirty-ice bodies that cognitive dissonance is on show when we get new data. And with the Rosetta spacecraft orbiting comet 67 P at a distance of a few tens of kilometers there is a flood of new data. At a media briefing following the Philae Lander’s unexpected multiple touchdowns, Eric Hand of Science magazine asked how cometary processes might account for the comet’s rocky appearance. Holger Sierks, the OSIRIS Imaging System Principal Investigator replied, “it’s rocky-like stuff, but not rock.” This unequivocal statement is based on the measured average density of the comet, which is less than half that of water. Rock has a density roughly between 2.5 and 3 times that of water. Even if the comet were made of water ice, the only way to match such a low density is to require the comet nucleus to be porous. So the Philae lander harpoons were designed to penetrate compacted snow. It’s fortunate the harpoons didn’t fire because the ricochet from solid rock would probably have the lander ricocheting back into space to be lost forever, a present danger I suggested before the landing attempt. As it happened, the lander’s multiple bounces over a hard surface caught scientists by surprise but happily Philae was able to remain on the comet and return useful data before its battery power was spent. I expect data about the interior of the comet to be confounding with little sign of the porosity required to produce its low measured density. It is even possible that the comet has internal cavities, which is not expected by the accretion model. So it is instructive to re-examine the comments made on the first close flyby of an active comet nucleus, which took place at comet Halley in March 1986. 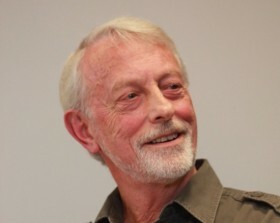 The editor of Nature, John Maddox wrote in a supplement on May 15, 1986 devoted to the first results, “there is a sense, even in science, when the journalistic principle applies that first impressions have a value of their own.” I would argue that first impressions are priceless because the surprises expressed are unfiltered by subsequent accommodation to the ‘one true story.’ Maddox summarizes the first reports, “What stands out from this symposium of papers is the surprising complexity of the environment of comet Halley.”No one was able or courageous enough to ‘think outside the box’ and suggest that the new discoveries invalidated the old story of dust and gas blowing away from an icy comet in the solar wind. There was no mention of scientists in the 19th century who compared cometary appearance and behavior to low-pressure electrical discharge phenomena in Geissler tubes. That model was simple and it made sense. But scientists in the space age have been indoctrinated that electricity plays no role in space. Meanwhile the results were no surprise to a few scientists who a decade or more before had published, perforce obscurely, a model of the Sun and comets as electrically discharging bodies. They were early pioneers of the Electric Universe who saw comets as a basic test of that paradigm. We are taught that comets are ‘leftover’ primordial bodies of interstellar dust and water ice from which the Sun and planets were born. A bizarre ESA publicity video for the Rosetta mission argues that the Earth’s oceans were filled early on by comet impacts. Incongruously, ESA released a report on 10th December titled, “ROSETTA FUELS DEBATE ON ORIGIN OF EARTH’S OCEANS,” that discredits that notion. It has been found that the D/H ratio of deuterium (D, proton plus a neutron) to hydrogen (H, proton) from comet 67 P is three times that found in our oceans. So now attention is turning to asteroids as the source of Earth’s water because meteorites are considered to be fragments of rocky asteroids and meteorites generally have a D/H ratio similar to the Earth. This is a typical response to contrary evidence in astronomy. The myth must be maintained even though asteroids and comets show so little evidence of surface water. However, using deuterium as a marker relies on assumptions about its origin in the hypothetical big bang and destruction in stellar nucleosynthesis, which are both unverifiable. Returning to comet Halley in 1986, water molecules are supposed to sublimate (change directly from solid to gas) off the comet nucleus in the heat of the Sun. Later, ultraviolet light from the Sun is thought to split the water molecule into OH and H. So we should expect more H2O near the nucleus than OH. However, the Vega 2 spacecraft found the reverse, which “may indicate the existence of parents of OH other than H2O.” This finding supports the Electric Universe model, which proposes comet nuclei as fragments of planetary surfaces. Their rocky surfaces are spark-machined by a cold cathode type of coronal discharge. The electricity is provided by the comet’s motion in the solar plasma’s weak electric field (which is also responsible for the acceleration of the solar wind away from the Sun despite its powerful gravity). OH is produced easily from clay and rock minerals by an electric discharge. Halley has a high gas and dust production rate, comparable to those of new comets. So it may have more to tell us about energetic phenomena than the short-period comet 67 P. The Giotto high-resolution camera imaging the nucleus suffered a power supply glitch about 12 seconds before closest approach to comet Halley. 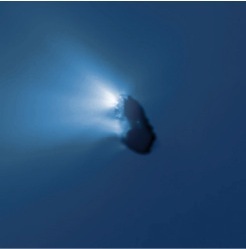 But it was the first to show a comet nucleus to be cratered and its emissions localized to high-energy jets. The inability to accept this jarring data is highlighted in the bland artistic renditions of comet nuclei in science news, which look nothing like the real thing. The power supply problem may have a simple explanation related to the electrical charging of the spacecraft in the comet’s highly active environment. It is now 28 years since comet Halley was imaged while ablaze with activity. 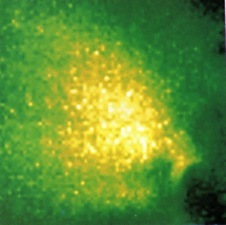 Details were published in Nature of two images of comet Halley. The first from a distance of 4,910 km shows the source of a bright dust jet. 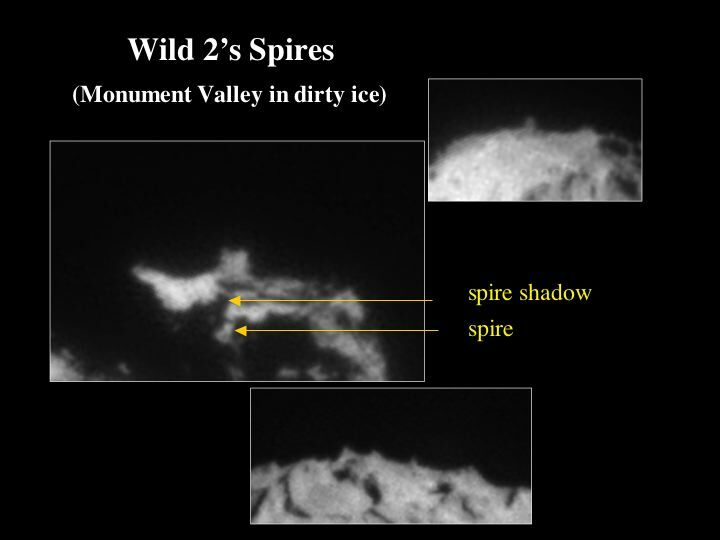 “The scalloped areas in the source region are ~0.5 km across and appear to be the source of smaller jets that combine to form the large jet.” “The area in which the large bundle of jets has its origin.. shows scalloped features resembling craters, each of which appears to be the source of a narrow jet.” The combination of jets to form a single jet is not characteristic of gases escaping through ragged holes into a vacuum. It is, however, behavior specific to parallel electric current streams according to Ampere’s law of electromagnetism. Notably, comet 67 P has scalloped edged circular craters, which were a surprise to the Rosetta team—proof that the myth of comets is more powerful than prior documented evidence. This is emphasized by the closest image of the comet nucleus (left) before the power supply glitch put the Giotto camera out of action. Here we see a jet source in high resolution from 2,220 km. The Sun is top left, 29˚ above the horizontal and 4˚ behind the image plane. Frame size is 3.7 km. The jet sources are bright spots, like those observed on a cathode surface in laboratory electrical arcs. They are not fissures issuing gas. Interestingly, given the smooth dust filled regions of comet 67 P, the Halley reports note that, “Dust particles seem to be swept towards the night side in the vicinity of the surface.” Comet Halley was found to be the darkest known object in the solar system. “A large C+ abundance throughout the coma indicates an unexpected source of atomic carbon.” “A major surprise ..is the very large signal from the C+ ion.” Photodissociation and photoionization of carbon compounds “cannot account for all of the C+ ions. Either there is an additional, hitherto unexpected ionization mechanism leading selectively to C+, or else there is an unexpected source of atomic carbon in the coma of comet Halley.” This would account for the extreme blackness of comets, coated with sputtered carbon atoms from surface minerals and electrostatically re-deposited on the comet nucleus as light absorbing fluffy dust particles. Evidence was also shown for complex minerals in the comet nucleus, “Ions of larger atomic mass unit are also present, corresponding possibly to various hydrocarbons, heavy metals of the iron group or to sulphur compounds.” This is to be expected from the sputtering of rock minerals. An electric field centered on a charged comet nucleus would be a simple answer. “The first clear evidence for the continuous presence of magnetic field variations signaling the presence of the comet occurred at a distance of 2 million km from the comet.” A similar discovery was reported in 1997 for the plasma tail of Venus at inferior conjunction, which stretches to the Earth’s orbit, a distance of 45 million km. “Standard physics says that narrow plasma streams are unstable and should dissipate fast. No one can yet explain how they hold together over tens of millions of kilometres.” These vast plasma structures are understandable if the magnetic field variations are an effect of electric currents flowing between the comet, or planet, and the solar circuit. A comet merely sublimating ices, the particles of which then suffer collisional processes with the solar wind, explains none of these features well, or at all. The transparent conflict between theory and observation is fundamentally important for the Electric Universe model of comets, which predicts a crisis in physics. If so, it will be instructive to see how it is handled; to witness how intellectual inertia can obstruct scientific progress. Professor Mike Yarborough of UC Davis in Sacramento wrote in Nature of November 20th, “Too often, scientists do not consider the need for improvements because they are content with their faith that science self-corrects. This is a bad idea.”The history of science exposes the claim of self-correction as a myth. Centuries may pass while experts cling to dogma. Science is done by ordinary mortals whose self-esteem is bound up with their claims to expertise. And experts show a strong tendency to set up exclusive guilds, which resist revolutionary change. Some scientists recognize the problems this causes and call for more interdisciplinary scholarship. That is the basis on which the Electric Universe has been built. History shows that many revolutionary breakthroughs have come from individuals, often self-taught ‘eminent outsiders,’ who see problems through ‘beginner’s eyes.’ But since the world wars of the early 20thcentury, a fire-hose of government funding for institutionalized science and education, together with the dead hand of anonymous academic peer-review, has worked to exclude the innovators. It can be argued that no fundamental scientific breakthroughs have occurred for a century as a result of these factors. I also suggest there has been a retreat from realism in science and the arts following the brutal realities of man’s madness unleashed in war. Modern surrealist science is hyped in the sheer nonsense of the film Interstellar, which we are told without blushing “is based on real science.” “Real science” today cannot explain what energy is, what matter is, why matter has mass, how matter has energy, or how matter can ‘warp’ space in some non-physical dimension to somehow describe gravity’s effect. To find a wormhole in space look for the worm casts outside the hole! This is the real source of the cognitive dyspepsia being experienced by the Rosetta mission team and it is a fundamental challenge for all physicists. The lesson to be learned is the real meaning of E=mc^2: MASS and ENERGY are PROPERTIES of MATTER. Mass is an energetic variable dependent on the presence of other matter and the electrical stress in the environment. Mass is not equivalent to the amount of matter. Just because both words begin with ‘m’ does not mean they can be substituted in the mass-energy equation. The calculated density of comet 67 P cannot tell us what the comet is made from. If it looks like rock, it’s safest to assume it is rock! It is not necessary for the low density to be due solely to high porosity of the interior of the comet. The electrical model even suggests hollowness as a possibility. So let’s return to the Rosetta mission and view the comments from researchers at the press briefing the day after the Philae lander bounced its way across comet 67 P’s surface. In the same issue of Science that warns that science is not necessarily self-correcting, there’s a report, “Philae’s 64 hours of science.” There we find the first panoramic pictures from its CIVA (Comet Nucleus Infra­red and Visible Analyser) camera showing a surface covered in dust and debris, with ‘rock-like’ materials in a range of sizes. “It’s certainly rougher than what we thought,” says Stephan Ulamec, Philae project manager. Data from another instrument, MUPUS (Multi-purpose Sensors for Surface and Sub-Surface Science), which includes a Coke-can-sized hammer mechanism atop a 40-centimetre-long rod to probe the comet’s surface, revealed a surprise: the comet seems to have hard ice underneath a 10–20-centimetre layer of dust, into which the hammer could not probe. “We were expecting a softer layer, with a consistency like compact snow, or maybe chalk,” says the DLR’s Tilman Spohn, principal investigator for MUPUS. The hardness of this sub-surface will, along with temperature measurements, help scien­tists to piece together how the comet’s coma of gas and dust forms. But it will have to be reconciled with the low density of the comet, Spohn says. It could be that the ice is porous, or that the hardness is specific to the cold, dark region where Philae came to rest. If it isn’t merely reflected light from a surface cleaned and etched by electric discharge then the “shining stuff” I expect to be active coronal discharges from the comet. If so, they will be featureless coronal discharge glows perhaps with unresolved bright points at active cathode spots. Already the official language is changing. NASA posted an article on Friday 12th headlined “Embers from a Rock Comet,” which looks like an attempt to introduce rocky comets into the astronomical lexicon. The article reads, “A ‘rock comet’ is a new kind of object being discussed by astronomers. It is, essentially, an asteroid that comes very close to the sun–so close that solar heating scorches dusty debris right off its rocky surface. Rock comets could thus grow comet-like tails that produce meteor showers on Earth.” But the distinction between asteroids and comets is ambiguous. Asteroid 3200 Phaethon resembles the main belt asteroid Pallas and approaches the Sun closer than any other named asteroid. However, Phaethon showed anomalous perihelion brightening and sported a stubby cometary dust tail just after perihelion in 2009 and 2012. And like a comet, Phaethon seems to be the parent of the most massive meteor shower – the Geminids — which raises questions about how the asteroid loses mass. Can it be that asteroid and comet tails have more to do with plasma discharge near the Sun than with sublimating ices? Parsimony of hypotheses suggests that like comets, asteroid 3200 Phaethon’s meteoroidal dust tail is easily explained by surface arc machining, rather than the superficially appealing story, “intense solar heating blasts the asteroid’s rocky surface, causing 3200 Phaethon to shed meteoroids like embers spitting off a log in a roaring campfire.” Where are the volatiles to cause the spitting? What’s more those embers should have ‘gone out’ long ago. It will be interesting to witness if this article is the first in an attempt to save face by rewriting history. Experts demand to be in control of the narrative. This is easiest when the story impacts a single discipline. But if a comet is shown to be solid rock of low porosity and low mass, there is a fundamental physics issue that will change everything. The American Geophysical Union has its Fall 2014 meeting in San Francisco this week. The first science results from the Rosetta mission are due to be shared at that meeting on the 17th. Watch the language for assimilation of prior Electric Universe ideas. Comets do not have a hard crust covering an icy interior. There is no difference between comets and rocky asteroids other than the high eccentricity of comet orbits, which swings them toward and away from our electrified star and results in energetic electric discharge behaviour. The electrical model of comets, first proposed in the 19th century, is long overdue for re-assessment as the first step in establishing a real, rather than imaginary, context for 3rd millennium science. Only then can Rosetta live up to its name. An Electric Universe cosmology is a fundamental correction that has already been delayed by dogma for a century.